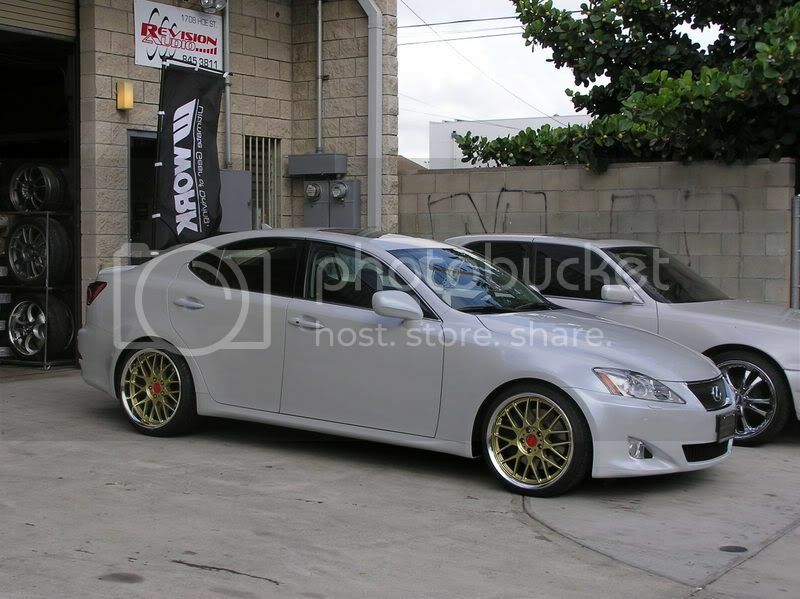 Lexus IS Forum > Owner's Forums > IS350 Owner's Forum > Got Mods? Please post your pics here: rims, tires, whatever you got, let's see 'em! nice everyone.. just picked up my is350 few weeks ago and sold my is300..
but VIP is more themed toward solid faced wheels..
well he did say "inspired" ...IS could be VIP styled though! I agree... It looks great!!! If I put Recaro Seats & BBS wheels on my IS300 that doesnt make it "Porsche Inspired"
I don't like gold rims but that is HOT!! Wheels alone don't make a car VIP inspired. Location: Mean Streets of Woodland Hills, Ca. Gold mesh wheels are not very VIP... Also, did you know that there are lowering kits available for that car? Other than that, you car looks good, just not very VIP.